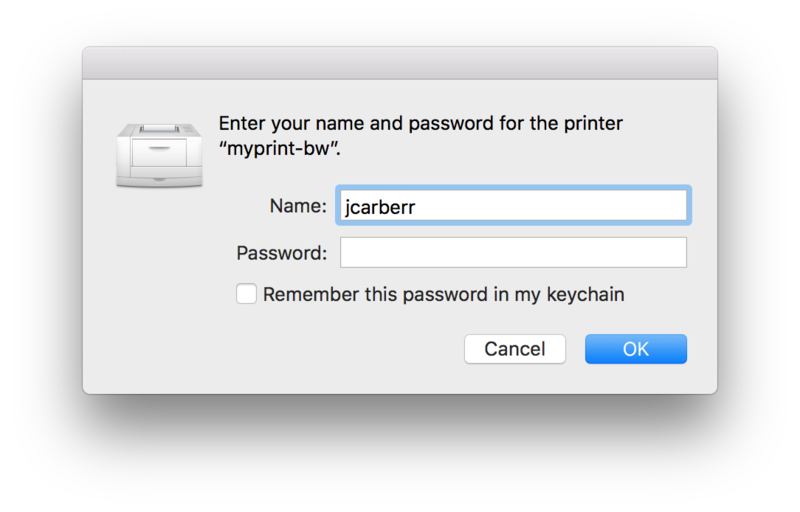 Note: If the application presents a "non-native" macOS print dialog (such as Adobe Acrobat or Google Chrome), you may need to click a button labeled something like "Printer..." or "Print using system dialog..." to display the native macOS print dialog. Select the Printer: drop-down menu and select the desired MyPrint print queue (myprint-bw or myprint-color). When prompted, enter your Brown username and password. Note: Your Mac's local account username will be pre-populated in the Name: field. Delete this and enter your Brown username. Click the "Remember this password in my keychain" checkbox to save your credentials if desired (not recommended on a shared login user account) and click Print to submit the print job. Issue: Hold for authentication - this error may occur if the username and password entered are incorrect. Solution: If you elected to not remember your password in your keychain, then simply delete the print job and try printing again. If you elected to remember your password in your keychain, open Keychain Access and search for "myprint" to reveal the saved credentials. Select the item and press the delete key or select Edit>Delete and try printing again. Issue: Printing - The printer is not responding. - this error may occur if the computer is not connected to Brown Wi-Fi on campus or using the Brown VPN off campus. Solution: Delete the print job, connect to the proper network, and try printing again.